Note - The model is wearing black suspenders which are sold separately. 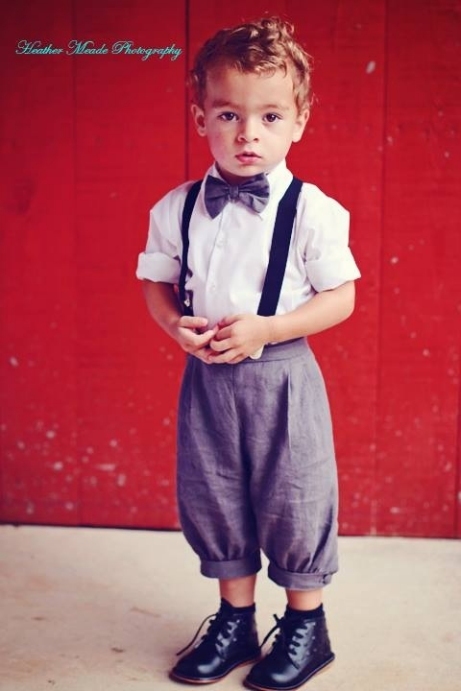 The set comes with gray suspenders as pictured below. A charming nod to days of yore. Better brand woven knicker set in a charcoal gray. 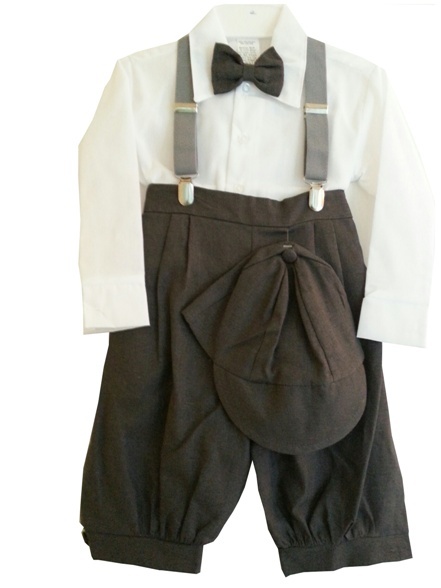 This 5-piece set includes a white shirt, clip-on bow tie, pie cut hat, knicker pants and gray suspenders. The shirt is 65% cotton, 35% polyester. The knicker pants are polyester and have an elastic back. The outfit runs fairly true to size, but the hats can be small. The hat has elastic in back. . Refer to the height / weight chart and order up if near the top of a size. Available in infant to toddler sizes, 6 month to 24 months and sizes 2, 3 and 4. The 2T is just a wee bit bigger than the 24 mo size. Made in the USA. Machine washable, gentle. The models are wearing optional black suspenders.